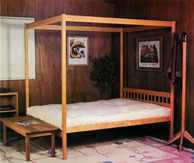 Style Furniture Fort Collins - Platform Beds, Futons, Beanbags, Daybeds, Füf Chairs and more! Today's modern bedroom is more than just a room to sleep in. The choice of quality, harmony, and modern living offered by our furniture recognizes this. Constructed from plantation grown imported hardwoods, we have a wide range of finishes and styles to suit many tastes. We can Custom order frames for you, as well! 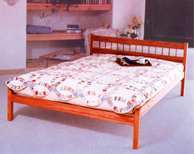 Simple - Our basic platform bed. Its simplicity is Zen-like. Available in 5 finishes. We carry too many styles to display! Come in to see our complete collection, or let us custom order the perfect Platform Bed for you! We're located at 3500 South College Avenue off of East Horsetooth and South College Avenue, behind Chili's in the Square Shopping Center, next to the Sleep Store. Call us at (970) 223-4567. We look forward to serving you!